Blowout Sale! 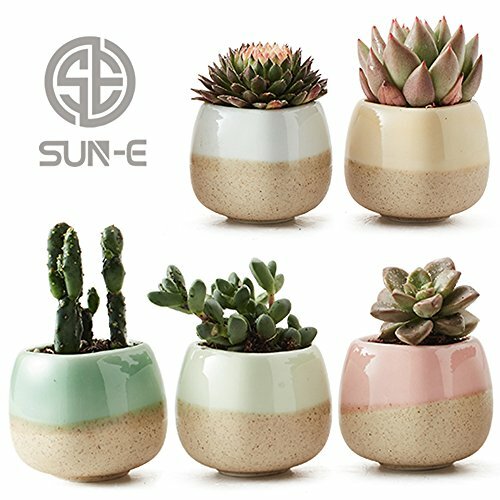 Save 71% on the SUN-E 5 in Set 2.2 Inch Container Planter Ceramic Flowing Glaze Five Color Base Serial Set Succulent Plant Pot Cactus Plant Pot Flower Pot Perfect Gift Idea by SUN-E at Tulips Orchids. MPN: 004-HW-5CaiCi001. Hurry! Limited time offer. Offer valid only while supplies last. SUN-E miniature garden fairy ornaments This SUN-E miniature ornament decor set can be applied in any miniature garden, dollhouse, plant decoration. New SUN-E collections!Ideal for adding a dash of refreshingly modern design to your home,Great Gift - this ceramic pot can serve a variety of purposes. Perfect gift for family and friends who love succulent plants with a green thumb or keep it in your own home for a touch of clean, modern style in your living space.